NYCDailyDeals -- What's Free And Cheap In New York City Today: Free Summer Concert Tickets... Right Now! A swarm of Summer Santas are wandering around Manhattan right now and handing out vouchers for FREE concert tickets as part of Live Nation’s “No Service Fee Wednesday” promotion (yes, we know it's Tuesday today...). You can also have a photo taken sitting on Santa’s lap as he lounges in a lawn chair surrounded by fluffy white faux summer snow and cooks up free hot dogs – the ultimate summer snack. Each of the 15 Santas will be carrying a sack of Live Nation concert ticket vouchers to hand out to lucky boys and girls, whether they’ve been naughty or nice. The vouchers are redeemable for concerts of their choice at participating Live Nation venues throughout the country. I was in Times Sq. from 1 - 1:30 looking for Santas... NO Santas in sight. FAIL. I tried the Union Square spot and found nothing. I like what you do on NYC daily deals, but sometimes the sources should be double checked. Live Nation’s ‘No Service Fee Wednesday’ continues with some much needed cheer -- FREE concert tickets, FREE hot dogs and a summer snow storm! 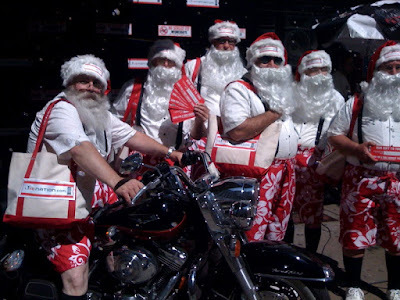 A swarm of Summer Santas will gather at The Fillmore New York Irving Plaza ( 17 Irving Place) at 11:00am on Tuesday, July 14th to celebrate Christmas in July by handing out FREE concert tickets as part of Live Nation’s “No Service Fee Wednesday” promotion. Passers-by can also have a photo taken sitting on Santa’s lap as he lounges in a lawn chair surrounded by fluffy white faux summer snow and cooks up free hot dogs – the ultimate summer snack. The 15 Santas will meet in a flurry in front of the Fillmore New York at Irving Plaza before hitting the streets of NYC to give the gift of free music. Each Santa will be carrying a sack of Live Nation concert ticket vouchers to hand out to lucky boys and girls, whether they’ve been naughty or nice. The vouchers are redeemable for concerts of their choice at participating Live Nation venues throughout the country. Live Nation, in its continued effort to give fans more of what they want and make concerts more affordable in these economic times, has launched its “No Service Fee Wednesday” promotion. Each week throughout the summer, Live Nation is announcing a different special ticket discount available for 24 hours only, eliminating service fees in amphitheaters throughout the country, for savings of up to 40%. This week, for 24 hours beginning at 12:01am on July 15th, lawn seats for all concerts at participating Live Nation amphitheaters will be sold for a flat-fee of $29.99, while all reserved seats will go for $49.99, with both options including a free hot dog and a soda. For more info and to purchase tickets, go to www.livenation.com. I'm sorry to hear that your readers were upset, but I do know that they were at each location at the given times because some of my colleagues (including bosses) were with the santas at each site. I don't believe they were in a clump so it may have been difficult to find one in those areas, but they were def there, and in total they distributed 1000 vouchers.